I understand that some like the color pink. Three-year-old girls, for example, Mary Kay cosmetics salespeople and Flamingos (don't say Paris Hilton, don't say Paris Hilton). Others, do not. 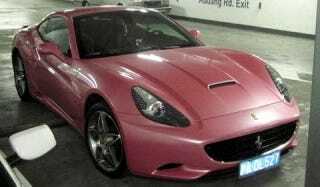 This Ferrari California belongs to someone in the former category. It's always just about 18 months after a new car model arrives that someone decides it would look better in the color of cotton candy or Jolly Rancher Green Apple. No one, other than the car's owner, is ever happy about it; the only solace we can take is that it normally affects the car's resale value in the same way driving repeatedly over Belgian blocks, then shooting at it with a Stinger missile, would. Ferrari attempted to head off these train wrecks by introducing its own Skittleesque palette. But you can never beat these people, you can only expose them.